The tendency for American politicians to breed more politicians is making keeping names straight a bit confusing. The Adamses, Kennedys, and Roosevelts all probably recycled campaign posters. 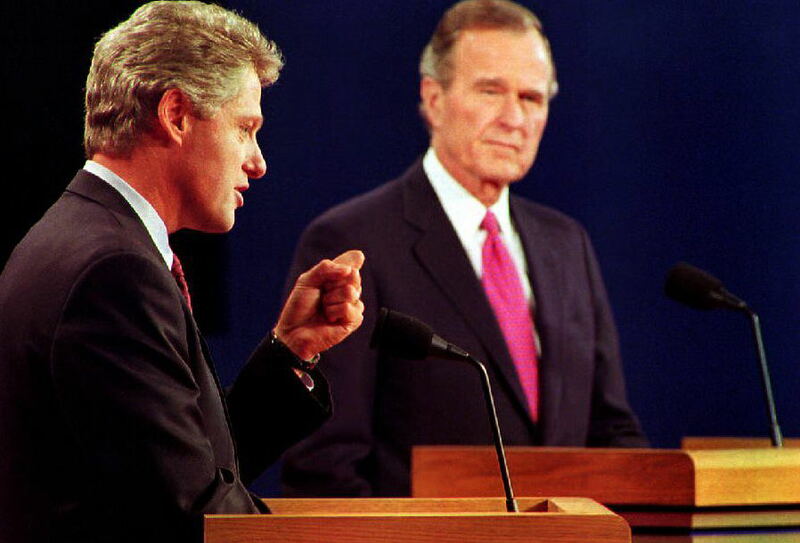 This year, there is an exact repeat so far: Clinton versus Bush. Hillary Clinton and Jeb Bush are squaring off in the 2016 presidential election — Jeb Bush announced his candidacy Monday afternoon — and surely making their families proud. These two are some of the biggest names in the election and each have a multitude of financial backers, according to Politico. The Huffington Post reports that nine out of 10 polls (with the only disagreeing poll being from Fox News) put Hillary ahead of Bush, though there is still almost a year and a half until Election Day. Bill Clinton won the 1992 election against incumbent George H.W. Bush. The Cold War was over, and Bush, whom many believed excelled most in foreign policy, no longer seemed as important. Voters began to distrust him for breaking his pledge not to raise taxes, according to the Encyclopedia Britannica. Elections are very different when the economy is good from when the economy is bad. The early 1990s faced a recession that called on political leaders to come up with a plan. People vote differently when frustrated with the current administration for economic reasons. Now that the United States is in an expansion, the debate can revolve around social and foreign policy issues. Hillary Clinton is not her husband, and Jeb Bush is not his father or brother. They both have huge legacies to continue but each one must take a different approach than their predecessor. Hillary has the enormous power of female voters to wield that Bill never faced. Jeb is already putting a focus on diversity that breaks away from previous style, according to The Wall Street Journal. The Clinton Administration would come to be marred with the Lewinsky Scandal, but personal matters came into the election before he was sworn in. Bill faced allegations of having an affair with Arkansas state employee and cabaret singer Gennifer Flowers as he was on the cusp of taking New Hampshire, according to The Washington Post. Personal gossip can affect voters, and so far, there are no great campaign scandals. The first election where social media really made a difference was 2008. Obama's win in the "Facebook Election" relied on an enormous social media following. Only time and analytics will tell whether Clinton or Bush will come out on top with the Internet. Ross Perot, the third-party candidate in 1992, changed everything for Clinton and Bush. Perot ran as an independent, and his one big platform point was balancing the federal budget. He ran as an Independent and took a large percentage of the vote from Clinton and Bush. If a third party did spring up, Hillary and Jeb would have to rethink their strategies and ask their families for advice. Because President Obama will leave the White House after this term, there is no one for the public to vent their frustrations to through the voting booth. The candidates are free to try to nab Obama's following but can distance themselves from him on whichever issues they wish. Gaining the first female president would certainly make 2016 a historic election, but even just the fact that she's running makes this race very different from the one in 1992. If Jeb goes head-to-head with Hillary, he's got to either find a way to take some female voters from her or capture the hearts of a new demographic. Like music, fashion, and pretty much everything else, politics were pretty different in the 1990s than they are now. Social issues such as gay marriage, the pay gap, and immigration reform were not nearly as pervasive as they are today. Economic and military issues took the largest focus, according to CNN. The names might remain the same, but not much else in the 2016 election will likely be repeated.